The program was facilitated by Cde. Ramhari Nepal president GEFONT Province no 3 and Cde. Arjun Aryal secretary GEFONT province no 3. Similarly , the meeting held in Bharatpur Metropolitan city extended congratulation to Cde. Govinda Aryal for being nominated as a member of GEFONT province no 3 committee. Likewise ,one day Municipal level orientation has been conlcuded in Hetauda sub-Municipality . The programme was facilaited by Cde. Purna Kumari karki GEFONT Deputy Secretary General Cde. Ramhari Nepal president GEFONT Province no 3 and Cde. Arjun Aryal secretary GEFONT province no 3. An interation among Garbage Cleaner and security workers working in Nepal Medical College. Cde. Ganesh Shrestha President Nepal security service Trade Union and GEFONT province 3 President Cde. 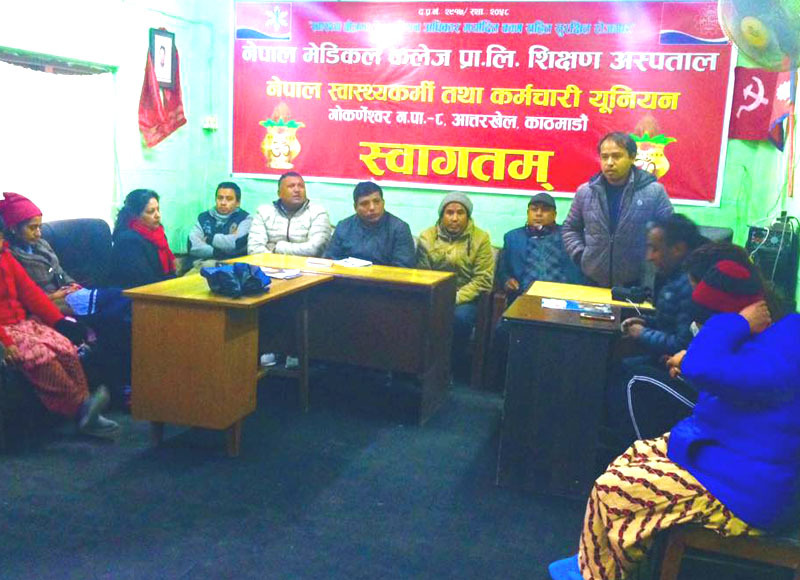 Ramhari Nepal facilitated the meeting. In the meeting , Cde. Shrestha informed that 120 workers working at Nepal medical collage from group 4 havenot received minimum benefit as per social security and labor law.